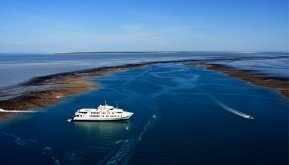 For 30 years True North Adventure Cruises’ flagship adventure has been the Kimberley Ultimate! 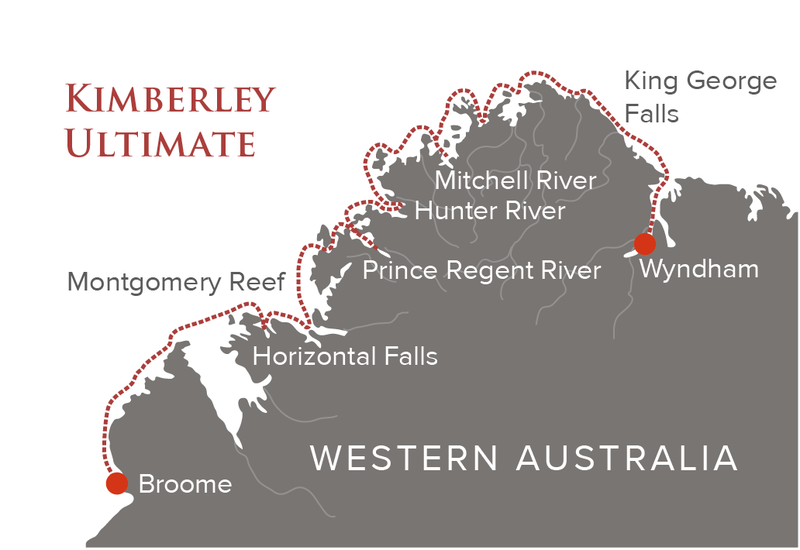 During this time the Kimberley Ultimate has also become known as one of Australia’s most exclusive holiday experiences – and for good reason! The Ultimate is simply 2 weeks of lavish indulgence. All of the Kimberley coast’s iconic attractions are included plus much, much, more and, all is enjoyed at a leisurely pace that ends with guests frequently remarking “that’s the best holiday I have ever had!” If you want not one heli-picnic but two – if you want more time for exploring, more time for fishing and, twice as many mouth-watering dining experiences – then the Kimberley Ultimate is the right TRUE NORTH cruise for you! This itinerary is provided as example only – prevailing conditions and local arrangements may cause variation. Helicopter flights can be purchased additional to the cruise tariff as a package or individually. 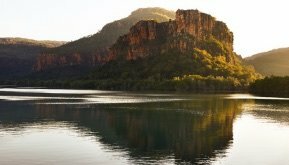 Join our coach transfer in Kununurra – your “welcome aboard” the magnificent TRUE NORTH will be in the frontier town of Wyndham. 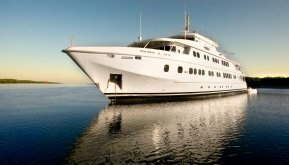 Embarkation is at 1700 – time for a cocktail with your fellow adventurers before departing at approximately 1830. Dinner is served shortly after leaving port and then it’s an overnight cruise to the King George River. As soon as the tide is high enough, we’ll cross the sand bar at the mouth of the mighty King George to reveal a breathtaking river vista. Our journey upstream will take us to the very ‘jewel in the crown’ – The King George Falls. Here we anchor at the base of the Twin Falls and you will find endless places to explore. 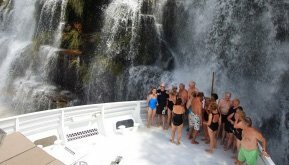 Climb or take the helicopter to the top of the falls for a cruise highlight. In the afternoon learn about the history of the wreck of the Koolama and take a stroll at Tranquil Bay. Explore the Drysdale and catch one of our favourite fish, the impressive mangrove jack! The expedition boats will head ‘up-river’ on a barra expedition complete with scones and billy tea! 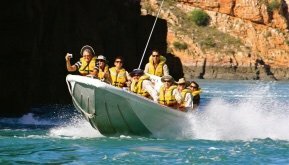 There will also be opportunities to indulge in some beachcombing and in the afternoon, join a scenic flight to Cape Londonderry – the northern most point of Western Australia! 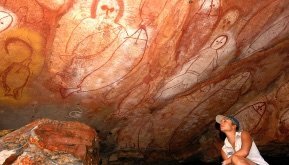 Today you will have an opportunity to see the “Bradshaws” – ancient rock art that pre-dates other examples of Aboriginal culture. In fact, they are possibly the oldest ‘paintings’ known to man. 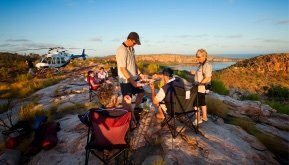 The heli-picnic at Eagle Falls is always a ‘big hit’ – another breathtaking helicopter flight and, TRUE NORTH’s mouth-watering fare alongside a picture-perfect waterfall in remote far-north Western Australia! The tenders will be busy exploring local beaches and rivers and, we also visit an isolated site in the rainforest where a lone bomber crashed during WWII. The Mitchell River is renowned for big barra and even bigger crocs! The expedition boats will head up river to the scenic Surveyors Creek – a great place for a swim (no crocs here!) 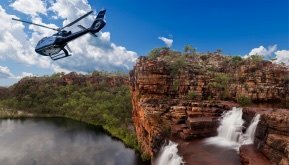 The fishermen will again join the hunt for the elusive barramundi and, there will be more opportunities for helicopter flights over an ancient land including the spectacular Mitchell Falls! Then, join the crew for cocktail hour before experiencing another unique dining experience. No time to dally – after an early morning breakfast it’s time to join the ‘hunt for the black-lip oyster’. In fact – their much-talked about proportions render them not hard to find at all! Savour their unique taste direct from the rock – aside from some freshly squeezed lemon, you can’t get much more a la naturale than that! 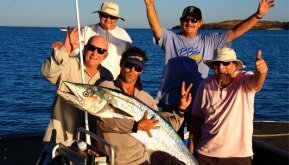 There are also some excellent examples of both Wandjina and Bradshaw art nearby and the waters are alive with light game species such as queenfish, giant trevally and mackerel. In the afternoon we will explore Voltaire Passage and the many surrounding islands. Back on board, the crew will explain the intriguing process of pearl farming. Then join us for our pearl party! Enjoy a glass of bubbly and a taste of pearl meat, whilst trying on exquisite pieces created by the artistes at Linneys, Jewels of the Kimberley and Kimberley Fine Diamonds. The Roe River – another great opportunity to catch a barra as we explore a river that boasts one of the highest crocodile counts in the Kimberley! The Roe was named after the Surveyor-General of Western Australia – John Septimus Roe conducted numerous expeditions along the Kimberley coast between 1829 & 1849 and the ship’s helicopter will dramatically demonstrate the maze of creeks and endless coast that the early explorers encountered! In the afternoon we will sail into Prince Frederick Harbour and enjoy sunset drinks on Art Island. Wake this morning in the magnificent Hunter River. The Hunter is about as far away as you can get in Australia – a stunning river system that is lined with dense mangrove forests, surrounded by rainforest encrusted mountains and home to man-eating crocodiles. And, the Hunter has it all – fishing, mud crabbing, bird-watching and simply exploring “where few have been before!” Join one of our expedition boats, it’s only a short hike to Jackson Falls and there’s even more splendour from the helicopter! Our first stop this morning is one of the Kimberley’s most historic sites – Phillip Parker King’s boab tree. And then it’s onto the mighty Prince Regent! The scenery will astound and there will be some ‘not to be missed’ fishing action as the TRUE NORTH graces this majestic river! At Kings Cascades we manoeuvre the TRUE NORTH right under the falls before another breathtaking helicopter flight to a picnic that you’ll never forget – TRUE NORTH’s mouth- watering cuisine alongside a crystal clear billabong – in one of the most remote places on earth! The helicopter will also be popular when the first group of intrepid explorers returns from Jurassic Park! Then we’ll rejoin the TRUE NORTH for an overnight anchorage off Camp Creek. The early-risers will be treated to a heli-flight with a difference – a champagne sunrise on the top of a mountain! Then it’s time for more ‘adventure in the tenders’ – a chance to stretch the laces on your hiking boots and an opportunity to swim in yet another picture perfect billabong. The more adventurous will use the helicopter to fish our most secret billabongs and everyone will find their own special place in the mighty Regent. This morning is devoted to exploring the Sale River. Fish the mouth for barra and then join naturalists and adventurers alike as we ‘ride the tide’ on a classic river expedition! Enjoy a swim in your very own billabong before returning to the ultimate comfort of the TRUE NORTH. You will probably be enjoying lunch as we weigh anchor and set sail for Montgomery Reef! Montgomery is a unique eco-system that must be seen to be believed – and see it you will – as 140 square miles of coral reef rises out of the ocean right before your very eyes! Water cascades from the reef as the tide falls exposing a privileged glimpse of another world! Turtles, dugong, manta rays and every imaginable sea creature abound and the helicopter puts all in perspective! Start the day with some more hot fishing action – this time at “Three Ways”. 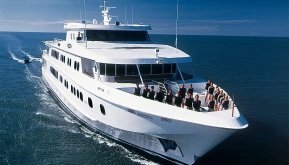 A short lunchtime cruise will deliver all aboard to the impressive silhouette of Raft Point. Here, join crew and guest alike for a moderate climb to an art gallery with a difference and, the well-preserved Raft Point Wandjina paintings. It’s time to ‘personally’ introduce you to another Kimberley icon – The Horizontal Falls. Experience the awesome power of the region’s huge tidal range in an exhilarating tender ride and then climb aboard your air conditioned helicopter for a view of the falls that very few experience! Enjoy a swim at Crocodile Creek and a walk on Silica Beach. 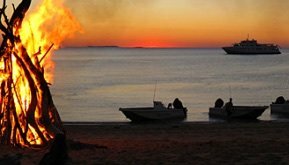 All too soon your adventure on the TRUE NORTH is coming to an end – enjoy a farewell dinner to remember as the TRUE NORTH glides past Cockatoo & Koolan Islands, Cape Leveque and down the Dampier Peninsula to Broome! Our arrival in Broome is in time for an early morning coach transfer to your accommodation or connecting flights – our crew are already looking forward to the next opportunity to welcome you aboard the TRUE NORTH! The Kimberley Ultimate with the Helicopter package was just the most amazing 2 weeks we have experienced anywhere in the world, made perfect by the fantastic services and support by the True North Crew. An amazing journey, we feel so privileged to have been able to enjoy the sensational Kimberley and to be treated with such enthusiasm and care by the wonderful crew. Impossible to beat – wonderful crew, scenery & outings. To all the boys & girls aboard, you made it for us!!! Thanks heaps! Thank you all for a most incredible experience. Each & every member of the crew has displayed a great attitude, consistently courteous, helpful & with a sense of fun. So many smiles!!! We have truly appreciated this wonderful opportunity to see this amazing part of our country and in such style! We will be back in December! Sales Manager Stacey Newton recalls a morning when she was lucky enough to join a TRUE NORTH oyster hunt! Weathered by eons of rain, wind and sea spray, these cliffs are almost as old as the Earth itself. Roderick Eime describes cruising Australia’s west coast. 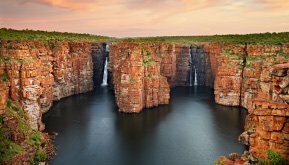 When is the Best Time to See the Kimberley? 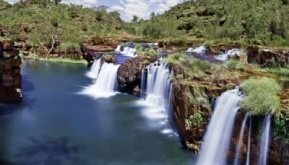 Why is the Kimberley Coast becoming a popular bucket list item? 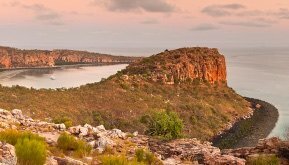 A lot of Australians and, increasingly more international travelers, are becoming aware that the Kimberley region is one of the last great remaining wilderness areas! And for this reason the destination has become highly aspirational.